I have always been really interested in this painting. It depicts a Brazilian family circa 1895 in the state of Piauí in Northeastern Brazil. The racial angle is interesting, as it shows each generation getting lighter and more European in appearance. Brazil was the last nation in the Western Hemisphere to abolish slavery (1888) however it had been on the decline in most of the country for the last couple of decades as increased immigration to the nation brought immigrant laborers (Germans, Spanish, Italian, Lebanese and other) and African slavery was more isolated in the north where the Caribbean-style plantations were. What’s an interesting juxtaposition with the Southern USA at the same time period is that the end of Brazilian slavery didn’t bring on a rush of miscegenation laws and social restrictions toward Afro-Brazilians. While personal prejudice and socio-economic conditions certainly existed and created its own castes, there were not laws created to keep former slaves in a separate category racially. The mixed-race population was already the largest in northern Brazil due to slavery’s exploitation of women, and the fact the earlier waves of Portuguese immigrants rarely brought across wives and families. The grandmother appears African, the daughter mixed-race, her husband European, and the baby very light-skinned. I have mixed feelings towards this painting. As you say, it could be seen as an exaltation of Brazilian society’s relative openness. Yet the title, Redemption of Cain, communicates the artist’s condescending opinion about Brazilians of African descent. Christians long regarded Cain, the Biblical son of Adam, as the ancestor of dark skinned peoples. In the Bible, a mark is set upon Cain to punish him for Abel’s murder and set him apart from the rest of humanity. Here, the artist suggests that miscegenation is a way of eliminating “blackness”, thereby erasing the mark of Cain. It would be okay if this view of blacks were restricted to whites in some time long past. Unfortunately, it is well known that many Africans in the New World accepted their inferiority. That’s the other aspect of the painting. The African grandmother seems to be giving thanks to God that her grandson is not cursed as she was. We often see miscegenation as a solution–something that we must do to fix problems of inequality–and praise the multiracial populations of countries like Brazil. But in saying that it is a solution or better than “intra-racial” relations, what are we saying about ethnicities themselves? Hi Tyler! That is SUCH a good point about the grandmother’s pose in a sort of “praise-be to God”, I hadn’t really thought about her postioning much but that really does seem to be the case! 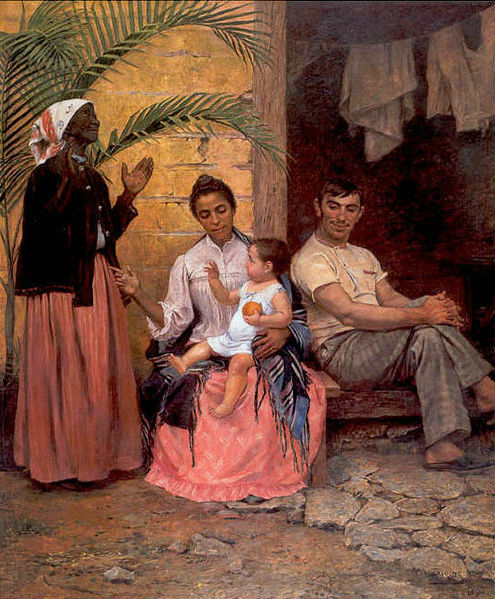 I have mixed feelings about the painting too, obviously, but what makes it so fasinating to me is how in this 1895 Brazilian context miscegenation is viewed as a fix to racial differences, or at the very least benignly creating happy families. As you can see from my blog a lot of my focus has been on the US Reconstruction period moving into Jim Crow, and this is so completely opposite to the US experience circa 1895. In the Jim Crow South you’d often find miscegenation waved as the ultimate bogeyman to justify all sorts of segregation and racist policy. You’d find pro-segregationists all but admitting some Jim Crow laws (like seperate waiting rooms or train cars) were overkill but justify them because if they were removed it would be the first step down that slippery slope to actual miscegenation! As you say, here racial intermarriage is viewed (condescendingly) as a positive vehicle toward removing Cain’s curse. This is a Masterpiece. It comunicates with the reality in such a intelligent level. As said, The remdeption of Cain it’s a reference to the Cain Curse, a biblical phenomena that was used to justify prejudice and slavery for a long time. However, in this painting, Cain’s curse is related to the black people, represented by the old woman, as all the racism that they have been through – Specially in a 19 century Brazil. You can see that she is praising to God because her grandson woudn’lt face the same curse that she faced, he is free from the curse.